PRE-ORDER YOUR 2019 JUNIOR SUPERHERO CALENDAR TODAY! This amazing calendar showcases 11 children and their superhero alter-egos! These children have not only demonstrated strength and courage while battling their illness, chronic pain or other health challenge, but they have shown compassion and drive in their missions to help make their communities a better place. 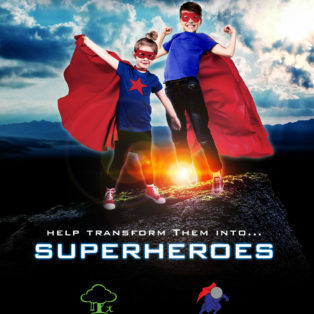 Don’t miss out on your chance to own your very own 2019 Junior Superhero Calendar and support us with 100% of the proceeds going to Help Fill A Dream. Secure your calendar by ordering before September 30th, 2018! Please select “Domestic Shipping” when placing your order. The charge is $5.00 CAD and will cover the the costs of shipping from our office to your home. Shipping to the USA? The charge is $8.00 CAD. Please select “International Shipping” if you would like your calendar sent to the US. If you wish to pay with MasterCard or Visa complete the contact info box below the PayPal and GPay buttons. Please contact [email protected] or call us at +1 250 382 3135 if you have any questions. Thank you for helping us make the impossible, possible.